This Sunday, a sizable segment of the post-deluge TV viewing audience will be reloading their liquor cabinet with Angostura bitters, scouring their basement for their best Cuban cigar, and sending their kids outside to play in the traffic. 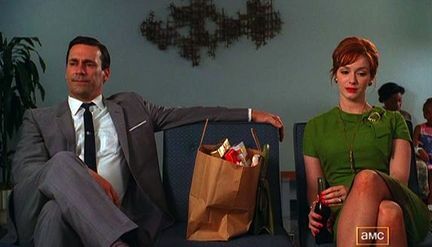 To commemorate Mad Men’s re-emergence from its well-deserved hiatus, allow me to eschew the character examinations and plot analysis that are better served by TV critics such as Alan Sepinwall and the Feministing crew. I am compelled to tell you about something else of far grander import – the cottage industry of accuracy-addicts, dutifully spelunking for anachronisms within the boundaries of the show. One of Mad Men’s greatest traits is the production team’s fierce dedication to detail. According to the New York Times‘ Ben Zimmer, the program’s critically-lauded prop team advised the producers to remove an Etch-A-Sketch from an episode in Season One because it was discovered that the toy did not become commercially available until one month after the scene was set. Here is a by-no-means-complete guide to a couple of the most (in)famous accuracy-hunters, and a description of their most significant discoveries of ephemera that did not exist during the show’s timeframe. Nostalgia, as Don Draper once told us, is delicate, but potent. My research has informed me that Zimmer’s work is at the root of almost all web-related content concerning Mad Men’s linguistics. So congrats are in order, Ben. I’ll hoist an Old Fashioned (with bourbon, not rye – sorry, Conrad Hilton) in your honor. As a member of the crappy-vision community (Team Strabismus), anytime we wish to read about 95% of printed material, we must ask this question: Will the content be worth the resulting headache? Small-size (10 point and below) serif fonts, such as the ubiquitous Times New Roman one finds in notable newspapers and almost every published book, have financed countless private-school educations for the spoiled spawn of Ibuprofen executives. Thanks to Firefox, which allows me to permanently alter a website to my choice of typeface and size, I’ve become educated on the crazy world of fonts (This documentary about Helvetica – yes, an entire film devoted to the typeface, and no, there are no car chases – was also a big help). Mad Men has meticulously placed period-specific fonts throughout every aspect of the show, including such mundanities as the grocery store displays that accompany the Helen-Betty tête-à-tête. However, a few anachronisms have snuck into the mix, which are chronicled by Mark Simonson’s highly-enjoyable studio website. Simonson, a noted examiner of the world of typeface, casually throws around font names and years of development like Johnny Drama referencing his guest appearances in tween-oriented sitcoms. Just to see the resulting furor, I would love to see the producers randomly toss a hilariously-intentional anachronism into an episode. I can’t decide which would bait more web-scribes: a conscious acknowledgment of the red herring, or complete obliviousness. Weiner and Co can go blunt by having Joan, after dropping the needle on a copy of the period-appropriate With the Beatles, look over at Harry Crane, as the camera briefly catches him glaring into a plasma screen TV. Or they could sneak in the inaccuracy as a quasi-code for the audience, sort of an on-screen Easter egg. For example, Don Draper could write an idea upon a napkin emblazoned with the iconic star-in-motion logo from the 1984 Los Angeles Olympics.